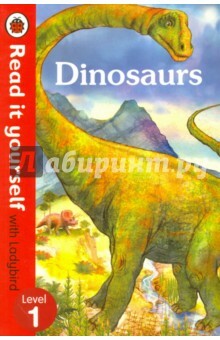 Dinosaurs Ladybird This book helps you to find out all about the dinosaurs that lived a long, long time ago - big ones, small ones, scary meat-eaters and peaceful plant-eaters. For over thirty-five years, the best-selling Read it yourself with Ladybird has helped children learn to read. All titles feature essential key words. Title-specific words are repeated to practise throughout. It is designed to be read independently at home or used in a guided reading session at school. All titles include comprehension questions or puzzles, guidance notes and book band information for schools. This Level 1 title is suitable for very early readers who are ready to take their first steps in reading. It offers a small number of frequently repeated words, simple facts, clearly labelled images and captions fully engage the reader. It includes contents, index and a picture glossary. This book helps you to find out all about the Dinosaurs that lived a long, long time ago - big ones, small ones, scary meat-eaters and peaceful plant-eaters. For over thirty-five years, the best-selling Read it yourself with Ladybird has helped children learn to read. All titles feature essential key words. Title-specific words are repeated to practise throughout. It is designed to be read independently at home or used in a guided reading session at school. All titles include comprehension questions or puzzles, guidance notes and book band information for schools. This Level 1 title is suitable for very early readers who are ready to take their first steps in reading. It offers a small number of frequently repeated words, simple facts, clearly labelled images and captions fully engage the reader. It includes contents, index and a picture glossary. Я купила книгу 4-х летнему сыну, с которым полгода назад начала изучать английский язык. Именно его уровень и его интересы. Теперь он знает динозавров, кто из них чем питается. Цель оправдана, книгой довольна. Информации мало, язык доступный. То, что мне было нужно. Понравилась именно для такого уровня вся эта серия. Покупала книгу в подарок и надо сказать, осталась вполне довольна! Картинки красочные, качественная бумага, английского текста не много, но вполне достаточно для первого знакомства с данной темой. Из минусов только маленький формат книги, я ожидала, что она будет больше. При довольно высокой цене книга слишком маленького формата. –20 % Выгода 191 ₽ Dinosaur Galore! 1 рец. –27 % Выгода 103 ₽ Peppa Pig. Daddy Pig's Old Chair 1 рец. Если вы обнаружили ошибку в описании книги "Dinosaurs" (автор Catherine Baker), пишите об этом в сообщении об ошибке. Спасибо!